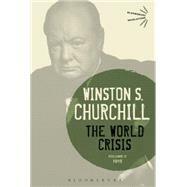 by Churchill, Sir Winston S.
The World Crisis is considered by many to be Winston S. Churchill's literary masterpiece. Published across five volumes between 1923 and 1931, Churchill here tells the story of The Great War, from its origins to the long shadow it cast on the following decades. At once a history and a first-hand account of Churchill's own involvement in the war, The World Crisis remains a compelling account of the conflict and its importance. The second volume of Churchill's history covers 1915 – the first full year of a conflict that most of the antagonists had expected to be over in a matter of months. Churchill here covers the intractable deadlock on the western front, the use of tanks and gas on the battlefields and the unsuccessful attempts by both sides to break through. In addition, Churchill also considers his own involvement in the Dardanelles campaign (Gallipoli). Sir Winston S. Churchill (1874-1965) was Prime Minister of the United Kingdom on two occasions, from 1940-1945 and again from 1951 to 1955. Celebrated as one of the greatest leaders of the twentieth century, he was also a gifted orator, statesman and historian. The author of more than 40 books, he was awarded the Nobel Prize for Literature in 1953 and in 1963 was made an honorary citizen of the United States.